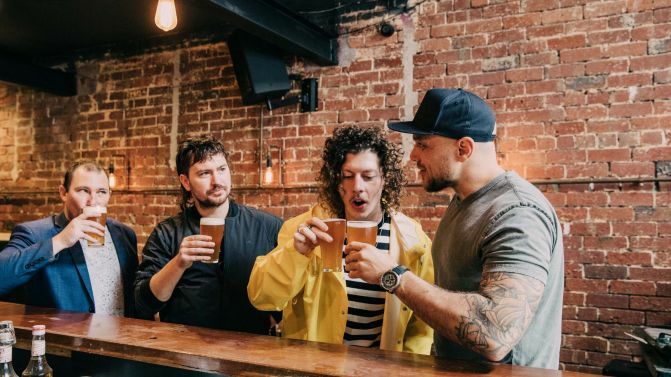 Peking Duk boys Reuben Styles and Adam Hyde can now add ‘restauranteurs’ to their list of job titles — after (of course) musicians, DJs and (just recently) children’s book authors. On Friday, 16th November, the pair opened a bar in Melbourne’s South Yarra called Talk To Me, alongside licensee Steven Hiles and chef James McCall. Speaking with Music Feeds, Styles says the venue became a reality after he, Hyde and Hiles bonded over their “hatred” for how early in the night some of their favourite Sydney establishments had to close. “It felt like we all were thinking the same thing in the back of our mind — let’s open a bar in Melbourne,” he says. Styles says the venue will host live music “in time”, but will start off by hosting DJs. “Each night will start soulful for the restaurant then slowly pick up with funk at around 10pm when food is finished. Eventually by midnight we’ll go all out with Japanese, Italian and ’80s disco, turn it into a heaving party. Styles describes Talk To Me’s menu as “Japanese-inspired New York cuisine” — but the ultimate question is: Is there any duck on the menu? “Yes, the menu has a ‘Duk’ Rillette, cooked in Fernet Branca [liqueur],” says Styles. Talk To Me is located at 153 Commercial Road, South Yarra. Check out photos of the venue (and the food), below.